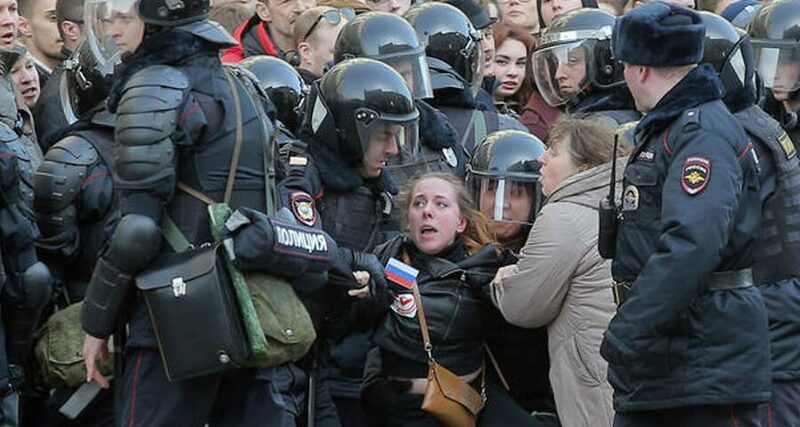 Police arrested hundreds of people after anti-corruption protests swept across Russia on 26 March 2017. In Vladivostok alone 26 people were taken into custody 1https://ovdinfo.org/news/2017/03/26/zaderzhaniya-na-antidimone. In Moscow the numbers currently stand at an unprecedented 1,043 people at 53 police stations all across the city2https://ovdinfo.org/news/2017/03/26/zaderzhaniya-na-antidimone-v-moskve. The go-to source for journalists covering these mass detentions is the OVD-Info3https://www.facebook.com/photo.php?fbid=10154513956872029&set=a.140668817028.113893.672177028&type=3&theater. OVD-Info is an advocacy group and an independent media project launched in December 2011 at the height of the protests that followed the alleged ballot-rigging in parliamentary elections, the project’s founder, Grigory Okhotin, explains. At that time, volunteers and journalists began to track mass detentions and to report on them. Within five years OVD-Info has evolved into a federal project that monitors both the freedom of assembly and the politically motivated repressions all across the nation. Legal assistance to the arrested is provided by the partner-NGOs of OVD-Info, such as Rosuznik, the Human Rights Centre Memorial and Pravovoy verdikt. OVD-Info does not offer legal advocacy, but in 2016 it carried out 199 initial consultations over the phone and helped its referrals to put together 48 complaints (“applications”) that were then sent to the European Court of Human Rights. Furthermore, OVD-Info regularly publishes resource packs meant to clarify certain aspects of the Russian law, which are usually unknown or obscure to the general public. For instance, an article ironically titled “Do Bears Eat Kids?” details the legal procedure of arrest and questioning of minors and lists their rights4https://ovdinfo.org/articles/2017/03/27/edyat-li-medvedi-detey. OVD-Info is not registered either as a media outlet or as a human rights advocacy group. For the past four years its key partner has been the Human Rights Centre Memorial, one of the oldest civil rights groups in Russia, that ever since its inception in 1989 has been committed to the research and publicising of the history of political repressions in the country6Russia’s Ministry of Justice has declared “Memorial” a “foreign agent” accusing it of “undermining the foundations of the constitutional order of the Russian Federation” and of “calling for a change of political regime” in the country”. http://unro.minjust.ru/NKOForeignAgent.aspx. The infamous “foreign agent” law (officially “On Amendments to Legislative Acts of the Russian Federation regarding the Regulation of the Activities of Non-profit Organisations Performing the Functions of a Foreign Agent”) was signed by Vladimir Putin in July 2012. Formally, it was introduced as a means to prevent “any direct or indirect interference in [Russia’s] internal affairs, any form of pressure on Russia”, but in practice the label of “foreign agent” has become a powerful weapon used by the government against the country’s NGOs. According to the “foreign agent” law, the NGOs that receive foreign donations and engage in “political activity” are obliged to register and declare themselves as foreign agents. They also have to submit to frequent and extensive audits and present particularly thorough reports on their activities. The very notion of “political activity” was not specified up until 2016: before that it was up to any given court to determine whether or not the activity of a particular NGO was political7See the Federal law N 7-ФЗ January 12, 1996, amended on 19 December 2016 “On non-profit organisations”. Article 2: non-profit organisations http://www.consultant.ru/document/cons_doc_LAW_8824/87a16eb8a9431fff64d0d78eb84f86accc003448/. Funding for the work of the monitoring team of OVD-Info is raised through a crowd-funding campaign. You can donate and support its work by clicking the “Help the project” button on the organisation’s website. The first crowd-funding campaign was launched in December 2015. The financial report detailing the use of donations for the year 2016 shows that the group managed to raise 2,044,696 RUB and spent 1,928,135 RUB9https://ovdinfo.org/report-2016/. The main expenditure item – the wages of its four staff members (30,460 RUB each) as well as taxes (400,000 RUB), communication costs, bank account service charge and the service fee imposed by the payment service provider. Okhotin claims that today OVD-Info does not experience any problem raising funds through crowd-funding campaigns, however, in its early days the group often found that the banks wereunwilling to have anything to do with it. Other costs and expenses are covered through special joint projects that OVD-Info carries out in cooperation with Memorial. These are funded by the European Commission and the Fédération internationale des ligues des droits de l’Homme. In 2016 these two agencies provided a total funding of 1,421,783 RUB10https://ovdinfo.org/report-2016/#second. Alisa Ivanitskaya, a senior editor at RDW-Media, was a contributing editor at Mail.Ru Group, writes for Mail.Ru, Afisha Daily, Snob.ru, and other media. She studied international journalism at Moscow State Institute of International Relations in Moscow in 2006-11, along with covering street political movements and social politics as a freelance journalist for newspapers Kommersant and Moskauer Deutsche Zeitung. After graduation in 2011 worked for PublicPost.ru (2011-13), Big City Magazine (2013-14) and later for News Agency TASS. Currently as a Marion Doenhoff Program’s scholar is a trainee by Deutsche Welle.